Pecan pie is one of our favorite desserts. But it uses a heck of a lot of maple syrup and pecans and is a bit of a faff to make unless it’s for a special occasion. 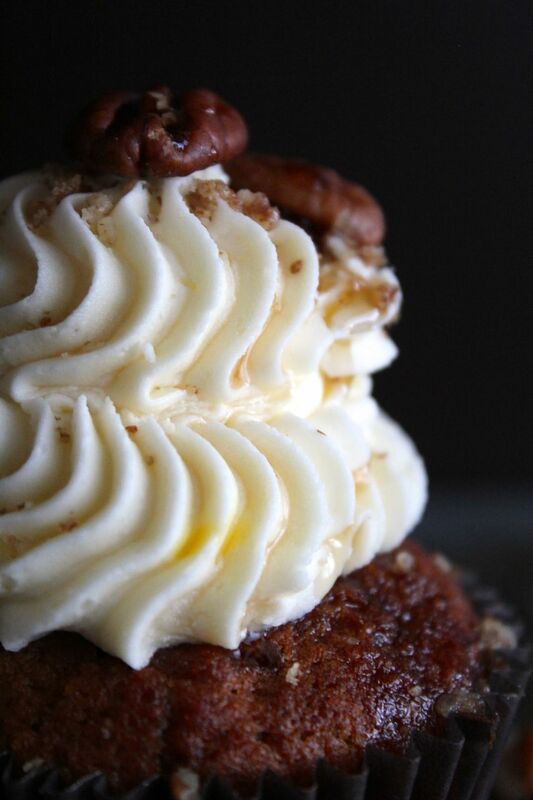 So here is the next best thing, Pecan Pie muffins. 18 – 20 mini muffins or 10 – 12 regular sized. I prefer them warm from the oven with a little scoop of vanilla ice-cream and without the frosting, but the kids like them with the frosting. Grease and flour the muffin tins well if you are not using lining paper as these can stick quite badly. Preheat oven to 350 degrees F (175 degrees C). Butter a muffin or mini-muffin tin or use paper muffin liners. In a medium bowl, stir together brown sugar, flour and pecans. In a separate bowl beat the butter and eggs together until smooth, stir into the dry ingredients until just combined. Spoon the batter into the prepared muffin cups. Fill each 3/4 full and bake in the preheated oven for approx 15 – 20 minutes depending on size. Cool on wire racks when done. Make sure your butter is soft, pop into a bowl. Add your icing sugar & start to mix on a low speed. Once your icing starts to come together increase the speed to medium. Leave for about 10 mins on med-high speed or until it looks like whipped cream, then fold in the maple syrup. 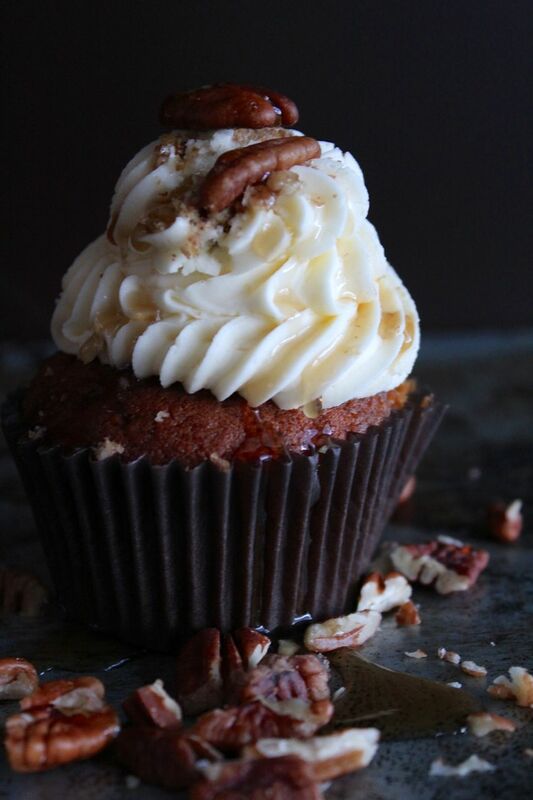 When the muffins are cold, spoon or pipe the frosting on, drizzle with a little maple syrup and scatter a few toasted pecans on top for prettiness. Delicious photos as always. I cannot resist maple syrup. These muffins are a great way to stretch expensive pecans. Love the photographs…. dark and broody …. very handsome! This is such a good idea. I love pecan pie but if I can’t be bothered with pastry, these could be my fix! I love pecan pie too! I made cookies that taste like it, and I’ll have to give these muffins a try too! 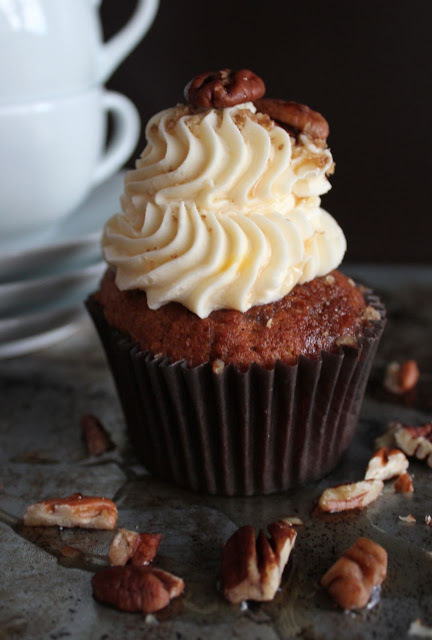 I never make pecan pie for the amount of effort it takes so love the thought of making these instead. I agree, ice cream for me and my kids as they can’t stand buttercream icing! Pecans? Maple syrup? Where do I sign up? How good do these look? Life ould be very dull without cake, for sure. Beautiful things. Great idea, far less work & a great taste. A little less messy too. Fab pictures as always. Made these muffins today, using the regular cup measurements rather than the gram ones. However, the recipe has been entered wrong for sure. Only one-half cup of flour? Needless to say the muffins didn’t turn out properly and took an hour to bake! By the way, the metric conversions are wrong, although that didn’t affect my muffins because I didn’t use them. For example, one cup of chopped pecans would weigh approximately 119 grams, not 240 grams as you have listed. I hope that you will post a revised recipe, maybe eliminating the metric conversions altogether.